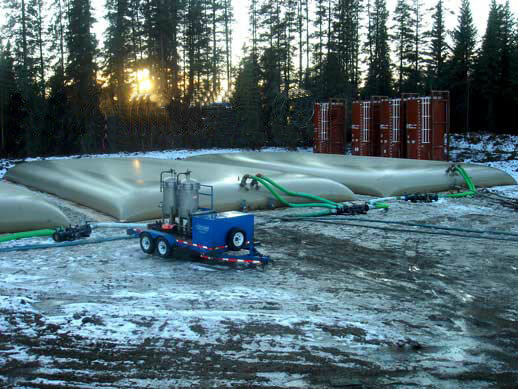 Do you have questions regarding of our flexible pillow tanks? You're not alone. Please feel free to browse through the commonly asked questions and information listed below. What are the Advantages of Using a Collapsible Flexible Tank for Drinking Water? Flexibility, custom sizing, lower shipping, low profile, and compact storage are some of the many advantages to using a flexible tank. Check out more Advantages of Using Collapsible Tanks. Do you have Small Potable Water Containers? Yes, our standard flexible water tanks feature sizing beginning at 25 gallons and going up to sizes as large as 210,000 gallons. In addition to these tanks, we also offer a flexible water bag featuring sizes from 1 to 5 gallons. Minimum order is for 10 bags. Do you have a 6000 gallon Water Holding Tank for Drinking Water Storage? What are the Sanitation Guidelines for Drinking Water? Do you have a Temporary Water Storage Tank for Gray Water? Yes, we do offer flexible tanks for both short-term and long-term storage. Short term storage tanks will typically feature a contact time for periods up to 1 year, with options for 3-5 years, and up to 7 years also available. Can I use a Bladder Tank as a Gray Water Tank for Camping Facility? 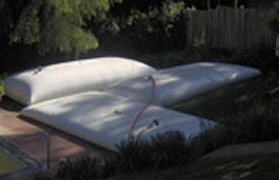 In addition to options for drinking water storage, we also offer pillow tanks that can be successfully used for almost any non-potable water storage option. What Options are there for Waste Water Storage Tanks? Do you have a Portable Water Bag for Gray Water that can be Placed Under a Deck? What is the Difference Between Black and Gray Water Pillow Tanks? Do you have a Grey Water Tank 1000 gallons in size? Do you have Potable and Non-Potable Tanks for a Kitchen? Do you have Large Jet Fuel Storage Tanks, say something that could store 50,000 gallons of Jet A Fuel? Both water and fuel storage tanks are available in sizes ranging anywhere from 25 to 210,000 gallons. This will include several large capacity tanks in common sizes such as 10,000, 20,000, 25,000, 50,000, and 100,000 gallons. Are there such as a thing as Flexible Tanks for Tank Farm? Yes, flexible tanks have been used in a tank-farm style setup that will connect several large-capacity tanks together. I am looking to a 55 gallon Fuel Tank to Store Biodiesel, what Type of Tank would you Recommend? Do you have Flexible Diesel Fuel Storage Tanks that are 1000 gallons or 2000 gallons in size? Do you have any tanks for Aviation Fuel Storage? flat on the ground. This allows them to be rolled or folded for easier transportation and storage. What is the best way to Purify Stored Water? Can Flexible Tanks be used in Desert Climates? I need Information on Pillow Tank Fitting Locations. Where are these Fittings Placed on the Tanks? Tank fittings can vary depending on the size and intended storage capability for your tank. Standard fittings for most tanks will feature a 2" fill with cap. Adapters may be added to meet specific hose or pump fittings. However, due to the flexible nature of these tanks, all sizes can be equipped with any number of custom fittings to meet the requirements of your location. Question on Collapsible Tank Performance: How well do these Tanks Hold Up in Cold or Hot Climates? Flexible tanks can be successfully used in hot or cold climates. Due to the wide range of applications available for these tanks, we offer several different fabrics including those designed to hold up well in both extremely hot and extremely cold conditions. Please let us know the temperature ranges you require for your tank, so that we can make sure we match a fabric that is equally equipped for these climates. Is there a 150,000 gallon Water Storage Bladder Available? Can you make a Small Water Storage Bag? Is there such as thing as a Circular Pillow Tank? 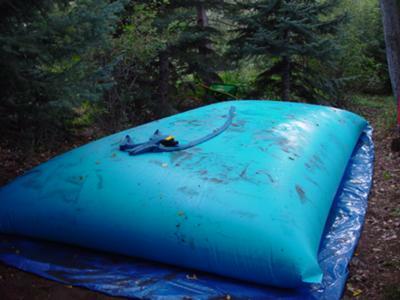 Is there a 500 gallon Water Pillow Tank with Rounded Edges? What Warranty do you have on a 25,000 gallon Flexible Tank? Is there a Cut Sheet for Pillow Tanks? Is there a Collapsible Tank for Fish? Do you have Flexible Bladder Tanks for Outdoor Storage? Can a Flexible Tanks for Water Supply System be used as a Supplement to a Municipal Water Supply System? Do you have Flexible Water Storage Tanks for Remote Homes? Is there a Flexible Water Tank for Showers? Do you have Flexible Storage Tanks for Water Reserve that I can Keep in Case my Well Runs Dry? Can a flexible tank be used as a Stationary Ballast? Is there a tank I can use for Concession Stand Water Storage? Is there such as thing as a Koi Fish Tank or Liner for Koi Fish Pond? 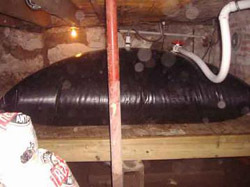 What options do I have for Water Storage in a Crawl Space? Is there a 1000 gallon Rain water Tank? Is there a Rainwater Cistern for Basements? Do you have an 1200 gallon Onion Tank? How Durable is a 500 gallon Blivet Water Tank? Can these Tanks be used as an Emergency Bathtub Water Bladder? Do you have anything large for water storage, like a 210000 gallon Water Tank? What is recommended as a Drinking Water Storage Tank for Villages? Interested in Big Flexible Storage Tank for agricultural purposes? Can the Emergency Water Storage Bag have a spigot? How large can I get a Bulk Oilfield Water Storage Tank? Can collapsible tanks be used for Temporary Potable Water Storage? Are they available in a 25,000 gallon size? What fittings can I put on a Rain Water Storage Bag? Do you also sell Frac Tank Liners? Is there anything in the size of a 5000 gallon Water Tank? What would be the advantage of using several of these 10000 gallon Water Tanks on my site? Do you have a 10000 gallon Water Storage Tank for brine water? Do you offer Under Deck Water Tanks? How large are they in terms of size? Do you have anything like a Water Tank for Fire Fighting available? What is the best Storage Solution for Emergency Drinking Water? 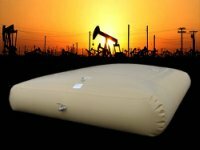 View the Pillow Tank page for information on all collapsible storage tanks.